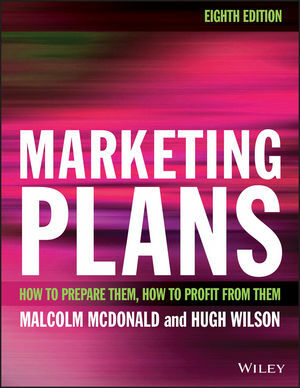 The 8th edition of this highly acclaimed bestseller is thoroughly revised with every chapter having been updated with special attention to the latest developments in marketing. Marketing Plans is designed as a tool and a user–friendly learning resource. Every point illustrated by powerful practical examples and made actionable through simple, step–by–step templates and exercises. The book is established as essential reading for all serious professional marketers and students of marketing, from undergraduate and postgraduate to professional courses for bodies such as CIM. Above all it provides a practical, hands–on guide to implementing every single concept included in the text. Until 2003, Malcolm was Professor of Marketing and Deputy Director of Cranfield University School of Management, with special responsibility for E-Business. He is a graduate in English Language and Literature from Oxford University, in Business Studies from Bradford University Management Centre, and has a PhD from Cranfield University. He also has a Doctorate from Bradford University and from the Plekhanov University of Economics in Moscow. He has extensive industrial experience, including a number of years as Marketing and Sales Director of Canada Dry. Until the end of 2012, he spent seven years as Chairman of Brand Finance plc. He spends much of his time working with the operating boards of the world's biggest multinational companies, such as IBM, Xerox, BP and the like, in most countries in the world, including Japan, USA, Europe, South America, ASEAN and Australasia. He has written forty six books, including the best seller Marketing Plans: how to prepare them; how to use them, which has sold over half a million copies worldwide. Hundreds of his papers have been published. Apart from market segmentation, his current interests centre around the measurement of the financial impact of marketing expenditure and global best practice key account management. He is an Emeritus Professor at Cranfield and a Visiting Professor at Henley, Warwick, Aston and Bradford Business Schools. In 2006 he was listed in the UK's Top Ten Business Consultants by The Times. Hugh Wilson is Professor of Strategic Marketing at Cranfield School of Management. Hugh has a mathematics degree from Oxford University, a postgraduate computer science degree from Cambridge University, and a prize-winning PhD in marketing strategy from Cranfield. Prior to joining Cranfield in 2004, he had 20 years' experience with IBM, Logica CMG, Xerox and others in consulting, product management and marketing strategy. Hugh consults to a number of world-class companies on marketing strategy, customer centricity and sustainability marketing, as well as teaching on these topics. He is joint Director of the Cranfield Customer Management Forum, a syndicate of leading firms such as Royal Bank of Scotland, Deutsche Telecom and BP exploring best practice in customer relationship development. He is a frequent keynote speaker for industry conferences. Hugh's research interests include customer experience management, omnichannel management, and value propositions. His numerous journal articles range from Journal of Marketing to Harvard Business Review. Hugh is listed in the Chartered Institute of Marketing's 'Guru Gallery' of 'the 50 leading marketing thinkers alive in the world today'. He has been honoured by the UK's Secretary of State for Industry and Tim Berners-Lee as one of the hundred individuals who have had most influence over the development of e-commerce.